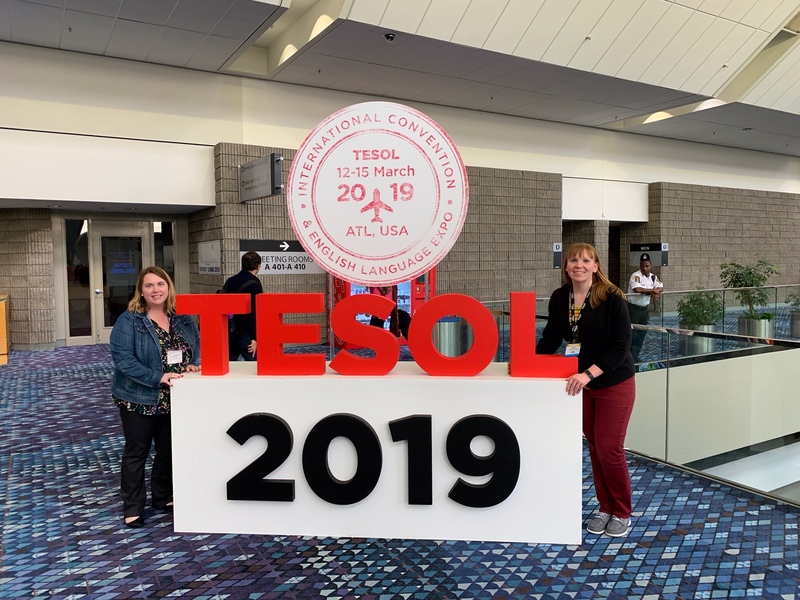 In 2019, WITESOL awarded three WITESOL members a $1,000 travel award to attend the annual TESOL convention in Atlanta, Georgia, in March. Enjoy some thoughts and reflections from the three award winners. “The annual TESOL International Convention provides the TESOL community the opportunity to connect, grow professionally, and expand our knowledge and expertise. We do so in recognition of the values that bring us together: professionalism, respect, inquiry, and lifelong learning” Segota, John. (2019, March 17). “Statement on 2019 International TESOL Convention.” Tesol.org. Retrieved from http://www.tesol.org. Thanks to WITESOL, I was given the opportunity to participate in this valuable exchange of shared learning, benefiting both students and teachers in the field of English Language Learners. Beginning with the keynote address examining the plight of endangered languages, to the closing keynote focusing on preparing our students for 21st learning, TESOL 2019 provided opportunities for active learning and shared pedagogy. My colleague, Susan Huss-Lederman and I were fortunate to be able to share our knowledge on project-based learning through our presentation entitled, “Investigating Environmental Sustainability Through Project-Based Learning.” We demonstrated how first-year international students benefitted from project-based learning through exploring environmental sustainability. Throughout our presentation, we were able to engage with other educators, connecting through questions and feedback. The presentation was recorded, allowing for further exchange of information and ideas. Our presentation was just the start of the global exchange of academic insight. My experience at the TESOL Convention allowed me to learn from others, as well. I was able to meet up with a former colleague from Gateway, and learned about the evolving educational system in the two- year colleges. Next, my educational journey allowed me the opportunity to hear John Hughes speak on “Critical and Creative Thinking with National Geographic”. Hughes is the author of the current textbook we use at UWW, igniting a broad interest in the topic he shared. In addition, I learned about key oral presentation skills to use with our business and listening and speaking students, and gained tools to use when observing students involved in conversation activities. The contact information, handouts, and presentation slides were made available to continue this network of learning. The knowledge gained at the TESOL Convention results in a shared learning experience. Next week, our English Language Academy Faculty will be meeting to exchange what we learned and how this recent educational awareness can benefit our students. Furthermore, my colleagues and I are presenting to our UWW partners on engaging international students in community-based learning and achievement in university courses. We hope to draw on the education gained at TESOL to foster learning across our campus. 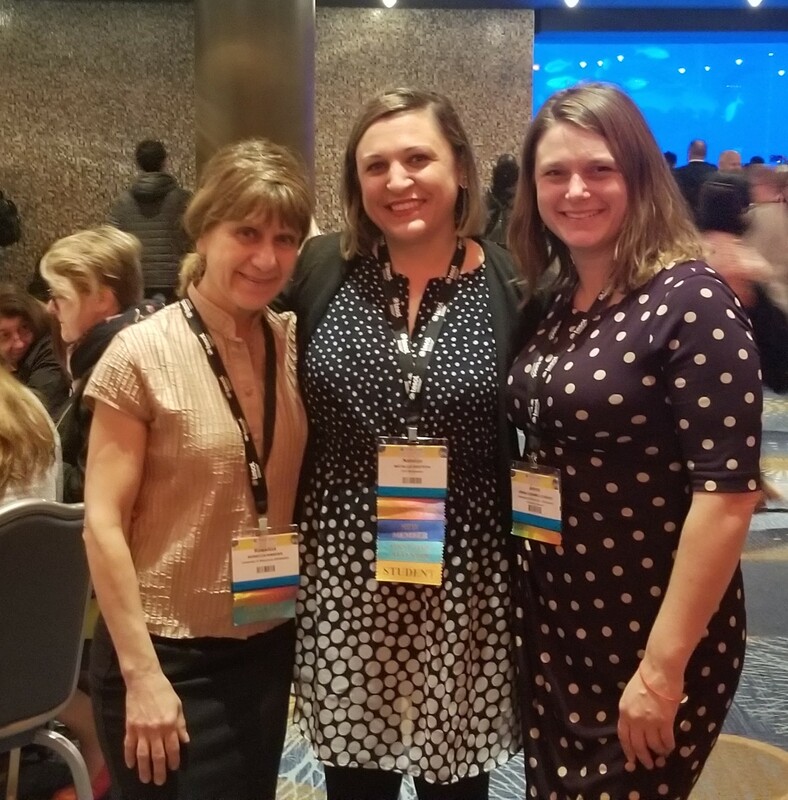 Through meeting with other WITESOL members, to learning about groups that facilitate connections with Intensive English Programs throughout the U.S., this convention gave me the unique ability to network with individuals of similar interest. I am grateful to WITESOL for allowing me the opportunity to engage with others, ultimately leading to new ways to help international students succeed. The speaker, William C. Cole-French from MCPHS University, was referring to the practice of not giving students oral corrective feedback in class. He likened it to not telling someone that they have food in their teeth, as it could lead to embarrassment if not pointed out. The TESOL 2019 International Convention and English Language Expo was filled with effective sound bites such as this during sessions, presentations, lectures, and teaching tips. Those that I attended and found the most useful and enjoyable were those that were practical, informative, or showed sheer ingenuity within our field. Cole-French’s teaching tip presentation was one of a set of short, 20-minute sessions that gave out practical advice for the ESL/EFL classroom. He explained his use of cards containing symbols to give instant oral corrective feedback on the most frequent errors heard in the classroom. His cards included humorous symbols to keep the content light: a Superman “S” to remind students of the third person present singular verb form and a “WTF” card for “What’s the Word Form?” (Cole-French, 2019) He or his students would hold these up when they heard the specific error in the classroom. In this way, the student is not singled out verbally; no time is taken from class to correct an error; and the student is immediately made aware that an error occurred. Simply by having this practice in the classroom, students are more aware of their own spoken English as well as their peers’. In addition to the teaching tips, many of the traditional 45-minute sessions also shared different classroom practices, including activities, curriculum content, and assessments. A presentation by Oregon State University instructors Lauren Funderburg and Rich Hahn explained why they went to a single-point rubric for assessing their students’ productive work. They argued that teachers write many comments for students regardless of how meticulously detailed the rubric is in explaining the degrees of proficiency achieved. They gave visual proof of their own to show how much of the rubric often can be ignored, along with written constructive feedback in the margins. With one single column of expectations for students to achieve, along with two columns for positive and constructive feedback, these “single-point,” or single-criteria, rubrics benefited both instructors and students. They encouraged the speakers’ students to seek out their teachers for explanations to start a dialogue about their work, and the rubrics saved instructors time in creating them. While the presenters admitted that this rubric would not work for every assessment, they stated how they find them effective for essays and presentations because of the individualized nature of the feedback (Hahn & Funderburg, 2019). As both of these presentations gave real and practical suggestions for use, I would like to implement both in my classrooms. The oral constructive feedback cards would be beneficial for my high school students, as I know they want and benefit from the feedback, but they also can be more sensitive to public correction in front of their peers. Instead of creating the cards myself, I may encourage the students to help design the cards to instill ownership of how their classroom culture is conducted. Additionally, I am currently piloting use of a single-point rubric for a paragraph assignment in my intermediate level class. I chose this class because it contains a more diverse group of proficiency levels. As the rubric allows for individualized feedback, it could be the perfect fit for the class. In my current position, my colleagues work at different local private high schools, so unfortunately, we are not in daily contact with one another. However, at one of our monthly meetings, I intend to share the above-mentioned practices that I gleaned from the convention. After piloting them in the classroom, I will be able to better explain and model them for my peers. If there are problems that I encounter as I transform these ideas from the IEP college classroom to the ELL high school classroom, I can troubleshoot those transitioning pains with my colleagues who teach in a similar environment. Attending the convention not only gave me the opportunity to pick up practical applications for the classroom, but it also provided encouragement for this time in the academic year. As spring has officially arrived in southeastern Wisconsin with most of the long winter’s snow melted, most instructors are preparing their final push to the end of the year. Hearing fellow colleagues across the country instruct their students following similar philosophies and methods filled me with a sense of determination and peace. It gave me the determination to enter my classrooms with the peace of knowing that my teaching instincts are validated by my fellow educators. Hahn, R. & Funderburg, L. (2019). Single-Point Rubrics: Why Less Is So Much More. 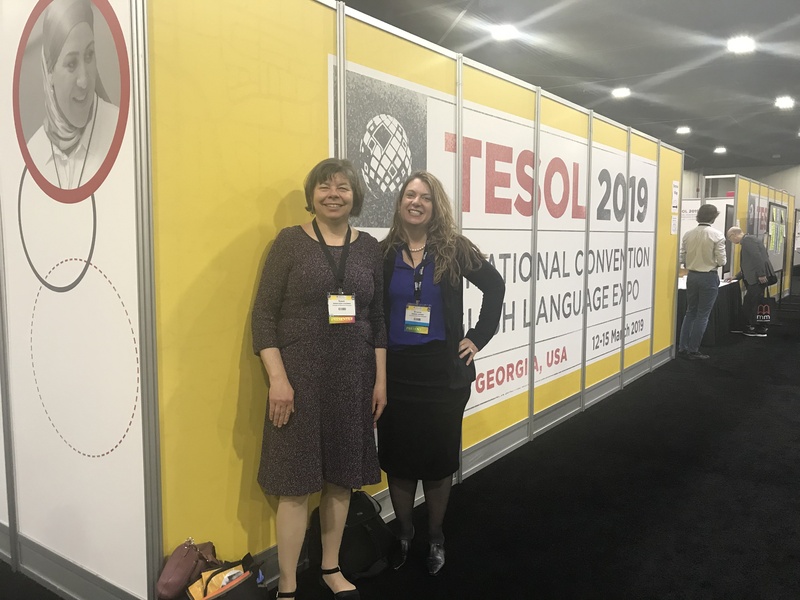 Presented at the meeting of TESOL 2019, Atlanta, GA.
TESOL International Association is a professional international organization for teachers of English who teach English as a second or as a foreign language, both domestically and internationally. Every year, TESOL organizes an international convention for all professionals in the English Language field providing professional development to educators from all over the world. The participants in this convention have the opportunity to share ideas with other colleagues while adopting and integrating new ideas in the field. This convention attracts more than 6,500 attendees from all over the world, and it is the largest event in the TESOL field (TESOL international association). As a student pursuing an undergraduate degree, I never thought I would have the opportunity to be a presenter at the TESOL convention while being still a student. However, my position as a tutor for international students at UW-Whitewater (ELA Academy) provided the opportunity for participating in this convention to share the amazing project that we carried out as part of the “Intro to U.S. Culture” course, a credit-bearing course for international students. A huge thank you to my professor Dr. Rossitza Ivanova, who was teaching the course, and who invited me to co-present with her at this convention. Attending the TESOL convention was one of the most profound experiences I have had so far. As a student pursuing a degree in English and English as a Second Language, the convention provided so many resources that I would use in my future career, and also provided fresh ideas about ways to teach while meeting the needs of our students. Being an ESL/multilingual student myself, I was pleased to see that more and more research shows that integrating the students` first language while teaching English is a productive way for students to become successful both academically and linguistically. In my college experience so far, I have been passionately advocating for the benefits of bilingualism and multilingualism and the positive outcomes for students who are taught English through their native language. A highlight of my convention experience was the opportunity to meet so many renowned scholars who I admire, and whose research is highly valued in the field. Some of them were Dr. Nelson Flores, professor at University of Pennsylvania, Dr. Ryoko Kubota from University of British Columbia, and the keynote speaker, Dr. Pedro Noguera from University of California, Los Angeles. These scholars, along with many other distinguished scholars presented on current topics relevant for the field, and provided insights and tips how to better serve our students, especially students from linguistically and culturally diverse backgrounds. Attending a convention of this type could be overwhelming at times especially because of the different sessions going on at the same time, and deciding which sessions are more worth attending. I chose to attend sessions that were focused on topics such as translanguaging, adult education, multilingualism – topics that interest me for my future career. I attended a session about ELLs in adult education, where the Department of Education provided an update about integrating programs that provide training for adult ELLs who did not have a formal education in the U.S. Later, I attended an exhibition session from the ESLlibrary.com organization, presenting the content of their website, and the resources that they provide to teachers and school districts, such as lesson and unit plans, quizzes, flashcards, tests, and so forth. The last session of the first day was “Infusing translanguaging to support EL students.” This session provided information how to use students` first language while teaching them English, and the benefits of using both native and English language in content areas. I attended a session that presented how the use of graphic novels helped students become proficient in reading and writing in English while promoting and teaching about equality, social justice, and mutual understanding between students who come from diverse backgrounds. Another session I attended presented the situation of migrant students who have experienced interrupted education, and the possible solutions that could help students become integrated in the new environment. As the world is facing a huge refugee crisis, this session was very informative about the ways that we as educators can help students who have experienced the struggles of being a refugee. The U.S. Citizenship and Immigration Services held a session about the process of naturalization, and I attended the session to find out more about the details and the steps needed when applying to become a U.S. citizen. As I am about to start my naturalization process, I wanted to attend this session and be able to ask questions about the process. On the last day of the convention, I attended the session of one of the keynote speakers, Dr. Pedro Noguera. Dr. Noguera spoke about “The Power of Language, the Language of Power.” He talked that the English language has become so powerful that allows for assimilation through language acquisition. He talked about the immigrant students whose parents do not get involved as much in their school experience, and in that case students often do not receive the same treatment as mainstream students do. His speech focused on the ways we can help immigrant students navigate the society while being opressed by the current political climate, and how teachers can become facilitators in language acquisition while promoting peace and pluralism in the society (TESOL international association). I attended the session “Imagining Multilingal TESOL Revisited:Where Are We Now?” where Dr. Nelson Flores was a speaker along with few other of his colleagues. Over a decade ago, many scholars introduced the idea of multilingual TESOL and how multilingualistic approach when teaching English is a benefit for all ELL students. The concept of translanguaging was prominent in this session which allows for a different approach when teaching multilingual students. Namely, translanguaging is a fairly new concept that allows a person to use all of its lingusitic funds of knowledge to make meaning. It seemed that many of these scholars are on board in using this approach,therefore all of them presented different aspects where translanguaging can be incorporated as a useful concept. The last session I attended was “Identities, Marginalization, and Intersectionality in ELT” where scholars such as Dr. Flores, Dr. Kubota, Dr. Motha presented “the importance of applying intersectionality to challenge linguistic discrimination in ESL/EFL classrooms” (TESOL international assosiation). They discussed how students and teachers who are not native of English often are marginalized, discriminated, and disadvantaged in the English-dominant environment. They provided insight how to challenge these perceptions and push back when exposed to discrimination and marginalization. I learned so much from all of these sessions I attended, and I cannot wait to become a teacher and implement the ideas and tips I received from this convention. Not only that, this convention helped me understand many issues that are going on right now, and how diverse students are set to succeed in an environment that imposes monolingualism and monoculturalism. I have already shared my convention experience with my classmates, and I urged all of them to participate in this or a similar convention. I also brought back many materials for my classmates that could be useful in our future careers as ESL educators. Stay tuned for details on how to apply for a TESOL Travel Award for the 2020 Convention. We will post more details in the fall of 2019.